At left is "Metamorphosis," ©Jane Sassaman 2000, which Robin Schwalb and I chose at Quilt National 2001, to be the award winning piece for the GREEN QUILTS Award for 2001. After looking at all the quilts and artist's statements of all the quilts in Quilt National 2001, carefully considering them during the opening ceremonies and all the next day, we selected Jane's piece for its clear representation of what our GREEN QUILTS movement stands for. The piece is made of cotton fabrics, machine appliqued and machine quilted. It is 78"H x 29"W.
Besides obviously having a wonderful composition which reflects Nature's harmony and beauty, we were very attracted to her statement, which reads: "Metamorphosis is about transformation and potential. A seed gestates in the muddy underworld and explodes toward the sun - an obvious metaphor for human life, discovery, and the development of innate potential." 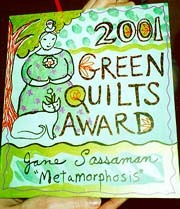 This was our fourth GREEN QUILTS Award ceremony to be held at Quilt National. Our award is not one of the official QN awards, and we don't give it at the opening ceremony at The Dairy Barn. Rather we stand on folding chairs, to be seen above the crowd, at the party given by Hilary and Marvin Fletcher, on the evening after the official opening. This award is not included in the labelling of the quilts, as they are shown, nor is it listed in the catalog. GREEN QUILTS continues to be a very "message in a bottle" type of project, and it's really all right for the award to stay on the outside of the official awards process. And we're very grateful to Hilary and Marvin for letting us do our thing at their home! This is Jane's award, which I painted on wood this time, rather than making a mini quilt for the prize. It features St. Quilta the Comforter and Marigold the cat, under the tree of life. 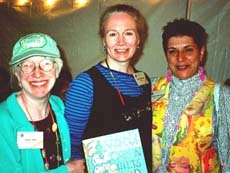 The three earlier GREEN QUILTS Awards went to Melody Johnson in 1995, Rhoda Cohen in 1997, and Maya Schonenberger in 1999. You can read about the last two in earlier GQ update pages here. Melody's award was given before we turned to the internet for our newsletter, so it was in the 1996 mailing instead. I was happy to notice this year, that the other people attending the opening were waiting with curiosity to see who would receive this unusual award! So I feel it is helping to keep the GREEN QUILT movement alive and well. Also, we are very happy to have given this award to Jane, who has been a faithful contributor to our GQ slide registry and who has exhibited her works in GQ exhibitions. She has been with our project for a long time, and we feel that all her quilts reflect the spirit of what we're up to with it. Ellen Anne Eddy sent me a full page of new slides to add to the GREEN QUILTS registry in April, and here I am, finally getting one of her images online! Sorry! 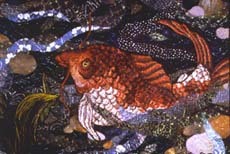 This is "Swimming Upstream," ©Ellen Anne Eddy 2001. 52"H x 38"W.
It's one of many new pieces Ellen has worked her Thread Magic on, creating a whole richly textured new body of work, since her medical emergency a couple of years ago. At that time she had no insurance and friends created an online auction of her work, which pretty well emptied her reservoir of quilts! I was amazed last Fall, when she visited me and gave me a trunk show of tons of wonderful new work!!!!! Ellen is in wonderful health, teaching all over the world, and is really making amazing GREEN QUILTS with all her work. Many thanks for refreshing your records in our registry, Ellen! 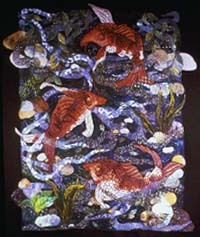 Here is a detail of Ellen's piece "Swimming Upstream." To see many new and exciting pieces by her, visit The Enchanted World of Ellen Anne Eddy. Web site origianlly created by Susan Shie and Jan Cabral ©1997. Subsequent web site work © Susan Shie 1997-2004. This page updated by Susan Shie, May 16, 2004. Web site hosting by Key to the Web, Ltd. ©2004.